I've been aware of this Japanese speciality for some time and have had in the back of my mind to try it out. Today I did, after researching on the net for a couple of days, having decided on this recipe. I spent last week getting the ingredients together but was unable to find dashi stock. Looking into it further, apparently dashi stock is made on dried giant kelp and dried bonito flakes. Now as you know, I'm not a big fish fan, so dried bonito flakes did not appeal in the least. But I found that occasionally the dashi stock can be exchanged for chicken stock. Also I had a few vegetables to use up. So here's what I concoted tonight. Peel and halve or quarter the mushrooms. Wash and slice the carrots and pepper. Bring the water to boil, then add the stock cubes and stir to dissolve. Add the mushrooms and vegetables. Cover and leave to simmer for a few minutes. Dice the tofu and add that as well. 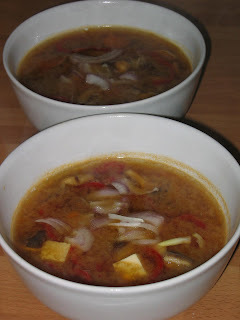 Mix the miso puree and the soy sauce in a bowl, then add it to the soup and leave to simmer for 5 - 6 minutes more. Slice the onion and use for decoration when serving. I had a little taste of the miso and had a very bad feeling of the soup, but on the contrary it turned out quite delicious. Lundulph had seconds. He also topped up with a few slices of chorizo. I think I'll try adding strips of chicken or pork next time. Now we'll finish off with some lovely ginger cake that we bought from our local farm market on Saturday. 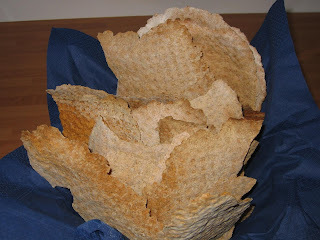 Finally after much consideration and sidetracking, I made some research on the topic of knäckebröd and baked some today. This is definitely a part of the Swedish staple diet, one interesting article (in Swedish) talks about the knäckebröd belt that goes through middle Sweden and that it has been a life saver for many during the late harsh Swedish Winters, when other food has run out. There is also a plethora of recipes on the internet and out of the three I chose to look into, limitations on ingredients combined with the lateness of the Sunday afternoon and it's relation to the opening hours of suitable types of shops, I decided to experiment from the start and combine elements of the three recipes. Here is the special knobbly pin that's so useful for these. I got it for Christmas last year from my sister Bip. I had whole fennel seeds, so I roasted them for a couple of minutes in a pan over medium heat, stirring constantly, until they released their aroma, then quickly poured them over to my pestle and mortar and crushed them as finely as I could. I put the water into my dough mixer, along with the fennel seeds, oil and salt. I also dissolved the yeast in the water, as opposed to mixing it in with the flour as you should do. Then I started the mixer and added the rye flour and finally the strong flour to form a stiff and non-sticky dough. Stiff in that the machine had trouble kneading it and I had to do the last bit manually to incorporate the last of the flour. As it has yeast, it needs to rise for about an hour, preferably longer. Cover the mixing bowl with a towel so the dough doesn't dry out. One recipe recommended leaving the dough in the fridge overnight for a really slow rise. The amount should give 18 - 20 cakes the size of a small plate. 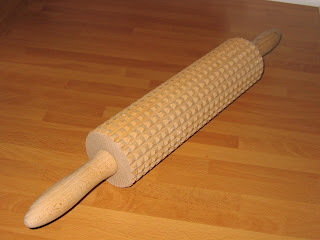 Roll out very thin, about 2 - 3 mm with a regular pin, then either prick the cakes with a fork or better, roll with a special knobbly rolling pin. And be generous with the flour too, it gives a more rustic look and tastes nice too. Pre-heat the oven to 250 degrees C (gas mark 9). Transfer the cakes to baking tins lined with baking parchment and bake for 7 - 8 minutes on one side only. Leave to cool on a metal grid so they can dry out and go crispy. They are very nice with butter when still slightly warm too, though. Because the bread is so dry, it stores well for a very long time. It's also very versatile - it's great with cheese, paté of all kinds, not to mention with fish. But also good with just butter or with jam. We went to our local farm shop yesterday and bought a number of interesting chutneys and relishes, so I rather suspect it will be nice to dip with. While I waited for the dough to rise, I found some inspiration from this blog. 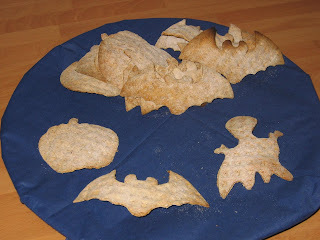 I'll definitely try out the recipes there, for now I just used my new Halloween cookie cutters. I made some mistakes though. The very first lot was not baked completely, as I didn't pre-heat the oven long enough. Then as I was rolling, I kept rolling thinner and thinner and some did get burnt. As for the fennel seeds, I bought mine at least 2 years ago for a particular dish and have kept them in an air-tight jar since. So they had definitely lost some of their flavour, but there was enough left in them, to just give a very mild hint in the bread every now and then. Unless you are a big fan of fennel, I'd suggest a reduction in the amount if the seeds are fresh. Today Lundulph had a very hard day. We knew it both in advance and I decided to give him a treat and make a new dish from my Thai cook book. This is indeed a beautiful cookbook, the photos are brilliant and even to a person like me that doesn't eat seafood, the seafood dishes look nice. Unfortunately it is an American book and all recipes are given with American measures. In addition, I think they have seriously underestimated some amounts, not to mention cooking times. The translation into metric leaves a lot to be desired too. So I end up correcting it and I don't really like to do that the first time I follow a recipe. My Mum can just read a recipe and know what's wrong with it, but I haven't mastered that knack yet. Well, excluding Thai fish sauce, Nam Pla (that sounds like Klingon, hi, hi). The book is very generous with it, I think the number of tablespoons of fish sauce should be halved and the unit should be teaspoons. Then it's just right. Anyway, enough rambling. 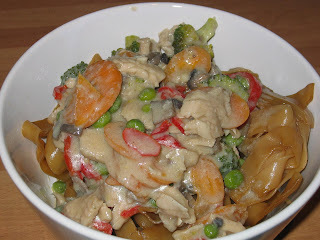 Today's recipe is called Guay Teow Raad Naa and is translated as Wide Noodles with Cream Sauce. And below are the measurements I used, not entirely according to the recipe. Mix the ingredients for the marinade. I had some very old finely ground black pepper that I used, the heat and most of it's aroma has gone, so if you're using fresh black pepper, the amount should perhaps be reduced to avoid it dominating the whole dish. Slice the turkey breast into really thin strips - about half a centimeter thick and across the muscle fibres, so that it soaks up the marinade quicker. Stir in the pieces into the marinade and leave to stand while preparing the other ingredients. Soak the noodles in hot water for at least 10 minutes until they go soft. The noodles are the ones I bought last Sunday from the Thai market. In their dry form they were translucent and I hoped they would go completely see-through, but instead they went white. Wash and cut up the broccoli into small florets; wash and slice the carrots and pepper thinly - about a third of a centimeter thick. Peel and dice the mushrooms if they are fresh, I used ones I'd frozen, so that speeded things up a bit. Heat up half the toasted sesame oil on medium heat in a wok pan. Add the soy sauce. Drain the noodles and add to the wok. Stir constantly until all the oil has been taken up and the noodles are pale brown. Take out of the pan and place in an oven-proof dish in the oven to keep hot. Peel the garlic, mix the cornflour with the water. In the same pan as before, heat up the rest of the oil, press in the garlic and leave to fry for about a minute, then add the water, fish sauce and sugar and stir well. Add the turkey along with the marinade and bring to the boil. Add the dissolved cornflour and stir constantly. A medium thick sauce should form, if it's too dry, add some more water. Leave to bubble for 5 - 6 minutes. Add the vegetables and mushrooms and stir in well. Let cook for another 5 - 10 minutes. It'll look like a beige stew, but the vegetables should still be visible with their bright colours. To serve, place the noodles at the bottom of a bowl and top up with the stew. Given my mishaps over the last week, I had very low hopes for this, it didn't look anything like the picture in the cookbook, but boy, was it tasty! So I did managed to treat Lundulph to a nice dinner. Will try to get a photo up tomorrow, we were just too hungry to bother with that today. Here is what it looked like, not too esthetically pleasing, but very tasty indeed. 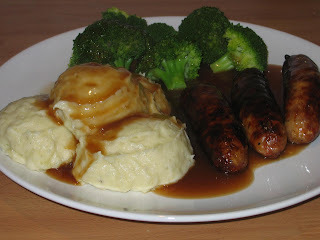 Well, after all the hints Lundulph has been dropping over the past days, I finally made bangers and mash for our Sunday dinner to celebrate the British Sausage Week. Together with Delia's perfect mashed potatoes. The sausages were some new-fangled thing from Sainsbury's with jalapenos, loads of garlic and lime and turned out to be very tasty. I also made a potato soup again, this time with leek, but that didn't help much, it didn't taste very nice, though it wasn't as bad as the first one I made a few weeks back. The fruit is physalis which turned out to have been picked far too early and was quite sour, some rosey Commice pears, which were quite tasty and fragrant and pomegranite. 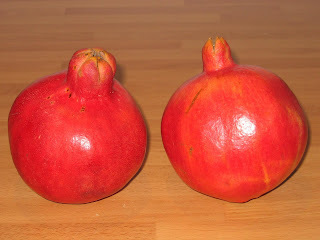 I love pomegranites and when I saw these in the supermarket, I just had to buy them. And they turned out to be quite sweet too, translucent pale pink. But once in the jelly, their colour was drained into nothingness. 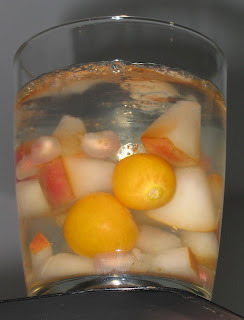 The jelly was quite tasteless, so note for the future - use juice concentrate and fruit with more colour and flavour too. So I seem to be in some sort of inspirational low cooking-wise. But I went to the Rumwong Thai Market in Guildford and got some interesting ingredients that I'll be trying out tomorrow, we haven't had Thai food for ages. Once again, I end up spending most of my Sunday in the kitchen cooking for the whole next week. My life-work balance is off balance at the moment, but some ingredients were left over from today's escapades and I've plans for them later on in the week. But today it was time to do another salmon pie. This time I remembered not to use any salt in the greens, sadly, when I looked back at the recipe, I realised that I'd forgotten all the herbs, so no wonder it didn't taste of much. The difference this time is that I chopped 2 green chillies and put in, but they turned out to be quite mild, so we didn't notice them. 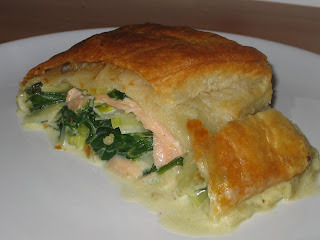 Also I only had one packet of puff pastry, so I rolled it enough to wrap it around the salmon and the greens. 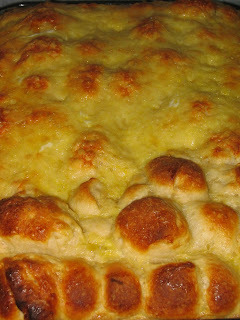 I've been wanting to do this Bulgarian bread for ages and I had a big box of grated cheese in the fridge which needed using up and so I baked milinki (милинки). They are popular as a snack or for breakfast in Bulgaria. Sadly they need some fine tuning as they were quite far from what my Mum's milinki taste like. Nothing wrong with the ingredients, mind you. If you are using fresh yeast, dissolve it in the milk. If using dried yeast, mix it in with 10 dl of the flour. Add the salt, sugar, vinegar and oil to the milk and mix well, then start incorporating the flour a little at the time. If the dough is too soft, add an additional 1 - 3 dl, it should still be a very soft and sticky dough. Leave to rise for 30 minutes. In the mean time, grease a deep (5cm) baking tin and melt the margarine. When the dough is ready, dip your fingers in the melted margarine and shape the dough into small balls, about the size of a small walnut. I found that squeezing the dough between my thumb and index finger worked well, it was all very slippery. Keep dipping your fingers and the dough won't stick. Line them up in the baking tin, quite densly, there shouldn't be any space between the balls. When the tin is full, cover with the grated cheese. Whisk up the 4 eggs with what's left of the margarine and pour over the cheese. Then leave to rise for another 20 minutes. Pre-heat the oven at 200 degrees C or gas mark 6, then bake for about 15 - 20 minutes until golden brown. If you've done it right, the milinki will rise almost above the tin. As you can see in the photo, I left some without cheese for Lundulph, however without the cheese, it's just plain bread. I think traditionally you'd use feta cheese and mix it in the dough. The milinki are quire nice hot with tea and we used to dip them in icing sugar, which sounds very strange, but is quite tasty with the saltiness of the cheese and the sweetness of the sugar combined. This is the first time I make these and I'm not happy with them one bit, if you look in the photo, the middle is very yellow and didn't bake well, this is a new behaviour from my cooker - it seems to bake only along the edges. Also I need to work faster and make the dough balls smaller, as by the time I'd filled the baking tin, the first ones had already risen to twice their original size. I'll have to watch my Mum when she makes them to work out the secret. The milkinki are good to freeze as well, I recommend cutting them up first, though. Then just reheat in the microwave when needed. The interesting thing is that the dough can be used to make ordinary bread, or as pizza base or as the Bulgarian mikitsi (микици), which are similar to doughnuts or churros. That's yet another thing my Mum makes regularly and we have it as a treat when we go to visit, it's far too greasy to eat often. Gosh, this past week has gone really fast! And thanks to my cooking last Sunday, we've lasted throughout it. Well, Lundulph was out a couple of evenings too. Make the potato salad first, by dicing the potatoes and steaming them until ready. In the mean time, peel the mushrooms and slice thinly. Peel and slice the onion thinly as well. Place mushrooms and onion in a bowl, add 1 tbsp of olive oil and the soy sauce, stir well and leave to marinate. When the potatoes are ready, set aside to cool a bit. Drain the mushrooms from the marinade. I rinsed them as well, to get some of the colour back, but that washed out too much of the flavour. Mix the mushrooms with the potatoes in a bowl, add the rest of the olive oil and some black pepper and stir in well. Preheat the grill at medium. Lay out the fillets on aluminium foil on the grill pan. Peel the garlic and press it over the fillets and rub in well. 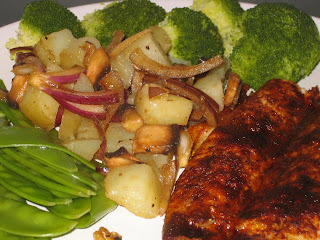 Drizzle one tbsp of grapeseed oil over each fillet and rub in. Sieve the paprika over the fillets, I used a tea sieve. This helps spread the paprika more evenly and removes lumps. Bake under the grill for about 3-4 minutes. Sadly I didn't time the fish and it was a bit over-done and chewy. Also I don't think the freezing-defrosting helped either. On the whole mackerel is a lot fishier tasting than I thought, and I'm not really a fish person. But Lundulph liked it, even if it was far from what he'd eaten at the restaurant. I'll try the paprika aioli next time, I think I need to smother it with garlic to take out some of the fishiness of it. Our greens were mangetout and broccoli. The broccoli seems to be in season now, as it looked very good, but didn't really work well with the fish and potato salad flavour-wise. The mangetout was better, but since it's well out of season, it was a bit stringy.